Daniel Decalso’s throwing error and a three run homer from Juan Rivera set up a five run inning that the Cardinals could never recover from as they lost 6-3 to the Toronto Blue Jays. Jaime Garcia took the loss and while his ERA is 0.88 at home, (best in the major leagues) Garcia was off at times last night. Garcia had four strikeouts and four walks, one off his season high, in seven innings. Four of those five runs in the third were unearned coming after Decalso’s error. Edwin Encarnacion homered off Ryan Franklin’s first pitch in the ninth and Aaron Hill added two hits and a walk for Toronto, which clinched the series win right after getting swept at Atlanta. Ryan Theriot and Jon Jay had two hits apiece for the Cardinals, who have lost 11 of 14 and are 1-4 while playing without injured Albert Pujols. 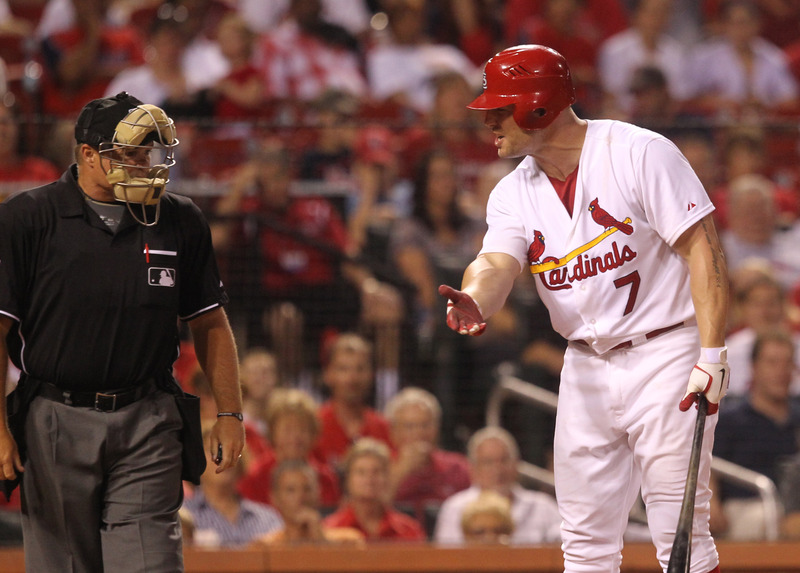 Matt Holliday was ejected for arguing a called third strike with two on and none out in the eighth and the next batter, Lance Berkman, grounded into an inning-ending double play against Marc Rzepczynski.